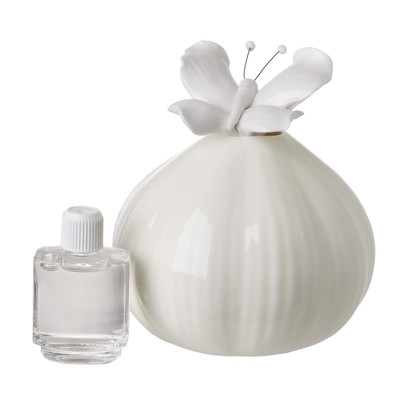 Lovely and unique, this faceted Bone china bottle with its wick and porcelain butterfly stopper looks like a piece right from old Italy. It is a sparkly, old Italian style decanter, which could have been used as a perfume bottle. It has a nice heavy weight to it, as the body is rather thick, This decorative bottle of the C&L would look great as a dresser accessory, on the bathroom shelf or vanity. It has a very a whimsical, feminine design and looks beautiful in the sunlight. Could certainly be used to hold perfume. Great sparkly, vintage glam decor for any room that needs a feminine touch.